Had some time this weekend to build in some stuff to improve my workflow efficiency and finished up something I've been working on for a while. These charts utilize a hitrater that is probably as close to accurate as you can get. It utilizes the same hitboxes as specified in the files and simulates the gun mechanics to a fairly good degree. For every weapon, for every burst length between 1-10, for every distance 10m-50m (10m increments), fire at the center of the chest 100k times. Use ADS minSpread. No bipod. Use the hits per region and their damage multipliers to compute expected damage for the burst. Divide that by the burst size for damage per projectile. Use the computed damage per projectile to compute effective BTK. Use the effective BTK with spread data (SIPS, FSSM, SDEC) to compute minspread shooting TTK for that run by combining time spent shooting and time spent recovering. For frame count, add the time spent shooting and the delay before SDEC starts. Convert this into frames. Take the time to recover spread and convert to frames. Remove one burst from each. Multiply by 60 for 60Hz frames. The hitrater does not account for RDEC. Since automatic weapons do not use RDEC, this is not an issue so long as the weapon is spread limited. The hitrater does not contain the forearms, upper arms, upper legs, and lower legs. Some of these hitboxes do not have transforms specified in the files so hits that would strike them will not show up. The calculation is based on average damage per bullet per run. Practically speaking, it is not really correct to divide the damage dealt by the number of bullets per run because damage is not averaged out this way. These charts will not reflect the strengths of Trench variants. They will appear to be the worst possible option you can pick. But if I were to compute a hipfire version, the winners would be very clear. Only 100k. Should shoot for runs in the millions. These charts only go to 50m. Performance beyond this range will not show up. It is possible to generate a table of bursts with their recovery times for an AI to use for pathfinding optimal bursts. A* pathfinding would be a good candidate because we are able to access the amount of distance we need to travel and the amount of distance we have traveled. For every distance, it becomes possible to know what the optimal shooting strategy is based on the burst sizes available to the AI. The FSSM accomplishes its intended design. Letting as large a burst as possible hit the target yields faster TTK than microbursting and tapfire. Storm variants are extremely strong because of their hRec reduction (LMG chart provides further evidence for this). The shorter your bursts and larger your FSSM, the more attractive True Factory variants become. Tapfire is one of the worst possible choices you can make next to magdumps outside of effective range. The MP1216 is a good example of what a BF4 version of this chart would look like. Microbursts are especially profitable because low SIPS means accuracy is maintained fairly well. If SIPS was higher, we'd see a move towards tapfire. TTK patch needs to happen, especially for the midrange SMGs which still take close to a second to kill. The SMG08 in particular suffers badly despite having a really good hitrate. The "best" burst is one that multiplies evenly into the effective BTK for your engagement. A burst that will land all its shots will be fastest. Two complete bursts the next. The absolute worst burst is one that falls 1 bullet short which makes sense because you waste time recovering. LMGs are already done. They're just very boring because it's a giant wall of same-ish looking numbers. They are also not meant to be bursted and the prewindup versus postwindup numbers are extremely different. The two have to be taken separately because the postwindup numbers suffer from misses incurred during the windup. If the current burst dealt 100 damage, check to see if the previous burst size inflicted 100 damage. If so, then we'll use that BTK instead of the current run's BTK. This fixes an issue with misses during an overkill run dragging down the average damage and making 8 round burst take more bullets to kill than a 6 round burst even though the target would already have died by the sixth bullet. What the MP1216 was apparently intended to look like. It is still really good. A big hit is taken for microbursting/tapfire which is expected. Magdump performance is slightly worse. Behavior is now in line with other SMGs. I abused it with microburst a lot, it felt pretty like a shortened range 8.35, with an over powered CQC TTK. What FSSM it has now? I asked and apparently it's 6x, same as Automatico. Ok @NoctyrneSAGA, your numbers convinced me that FSSM is better than BF4's version. However, the numbers for SMGs are too high. 1 second at 40m? Come on. The MP1216 chart kind of TTK is what I am looking for. Is there a way for implement FSSM that results in a chart with different optimal burst lengths, and TTK like the chart of MP1216? i.e. mostly green/light green for the fastest TTK. The color coding is the cell's position relative to all other weapon's bursts at that distance. The MP1216 shows up as nearly all green because across all distances it has the fastest TTKs. For all weapons to show up green in my spreadsheet, they would need identical TTKs. I see. But what I mean is that the optimal TTK for the MP1216 if we microburst it, is in the 0.6-0.8 second range. Is there any way to achieve this range of TTK on other SMGs with FSSM? Fixed a mistake where I forgot SDEC kicked in after a delay. Charts were calculated as if that delay did not exist leading to skewed numbers. This has been fixed. 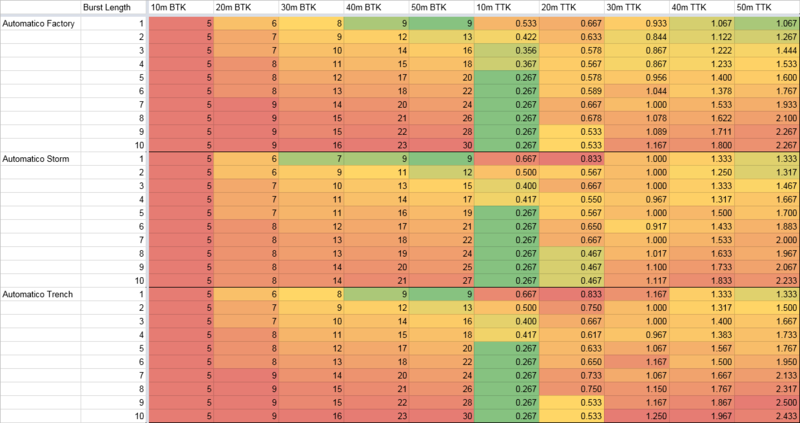 TTKs slowed down globally as a result with shorter bursts and tapfire being hit the hardest. MP1216 still remains best microburst weapon. Also added Frames To Kill.